Amanda Wendling - Making It Up As I Go: Getting Honest About Sleep! I hesitate to even write this post as I always cringe at the way our society treats sleep when it comes to babies. How many times have you heard, “so, how’s he sleeping?” This question always seems to be posed with an ounce of judgement – as if sleep somehow separates the good parents from the not-so-good parents. But, I’m writing this post anyway. Frankly, I’m writing it for all those parents who are living on four hours of interrupted sleep, caffeine and hope that tonight’s the night! Our trip down the road of severe sleep deprivation began innocently enough. We packed our little man up at 13 weeks old and sent him off to daycare. Sure, we weren’t sleeping great at that point but he was still so young, and we were sleeping as well as expected. But, daycare did what daycares do – they loved our boy hard! But, they also shared some germs with him. Those germs turned into a cough which was eventually identified as the dreaded RSV. 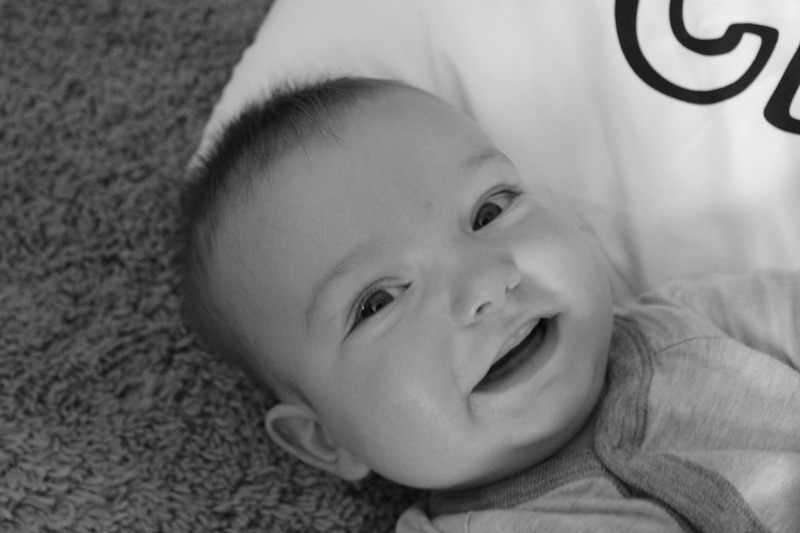 It took us the better part of three weeks to get him through the worst of the RSV. Our hope was once he was feeling better, we’d build some better sleep habits and right our ship. But, RSV gave way to one ear infection after another, and now our little guy hasn’t had a clear ear since the beginning of February. Sleep is hard to come by for Mom, Dad and Baby Boy these days (thankfully Nora is still sleeping like a rock!). Andy and I have both missed work and social outings abound. I’ve never been a fan of the idea of cry-it-out, but I’ve also never gone this long on such little sleep. We never made a choice to co-sleep, but we’ve admittedly landed there when the nights have gotten long and busy days lie ahead. I’ve felt like a horrible parent and a great parent in the same day. I’ve cursed myself countless times for not putting him down “drowsy but awake” more often, and have felt jealousy when I hear about friends’ babies who sleep! But, we’re doing the best we can – just like the parents with a sound-sleeper! We’re shedding tears at 2:00 in the morning because we don’t know what’s wrong with our baby. Then, we’re drowning our under-eyes in eye cream and running a business meeting the next day. We’re making time for doctor appointments and strategic planning sessions while not folding the laundry. There are dishes in our sink, and not enough hours in our day, but cuddles are plentiful. Here’s what I’m trying to say about this sticky subject of sleep… we’re all more alike than different! Maybe sleep isn’t your battle – maybe it’s something else. Regardless, it’s important to remind ourselves there’s a story behind every struggle. If we can remember that, we just might find ourselves with more comrades in this battlefield we call parenting. This post previously appeared on St. Luke's Birth Care Center.